Monday was a mixed day weather wise. The forecast was for bad weather so we decided to stay close to the camp and not venture over to Boy Bay. First things first, however and that meant taking care of the young master before any thoughts to the rest of the day. There were Ringed Bill Gulls everywhere, on the lake, on the beach, on the stair railing leading to the cabin. I never got tired of capturing their images. This is one of my favorites, but I have one that is much better than this one. I’ll show it another time. The weather was cool, damp, and windy, which translated into rough water. We fished Stony Point in the morning. The water was pretty rough out in the main channel but where we were it was manageable. Ben caught a 24 inch Walleye and it was a beautiful fish, but 4 inches under the size restriction, so back he went for another opportunity. I often wonder if fish have a memory. I mean once they’ve been hooked are they likely to be attracted to a minnow chasing a bright spinning object again? The weather got too rough and uncomfortable to be in the boat so we went back to camp to hang out with Jeanne and Josh. These hardy fishermen were just in front of our dock out about 350 yards. They were anchored and they stayed there for several hours. I couldn’t tell if they were catching anything but I would think they must have been to stay there that long. Enjoy your day. Thanks for stopping by. Be careful. When we finally got back to the camp from Boy Bay there was still a lot of daylight left. Knowing the weather forecast for the next day was not for a particularly nice day, we decided to head out for a boat ride with the whole crew. The water was fairly calm and so we could cruise around the area at full throttle. The temperature was a little cool but just feeling the wind on your face and the gentle bounce of the boat, splashing waves and the occasional loon calling were just wonderful. I’m not sure what Joshua thought of the whole experience. His little life jacket was pretty restraining so he wasn’t able to move much. 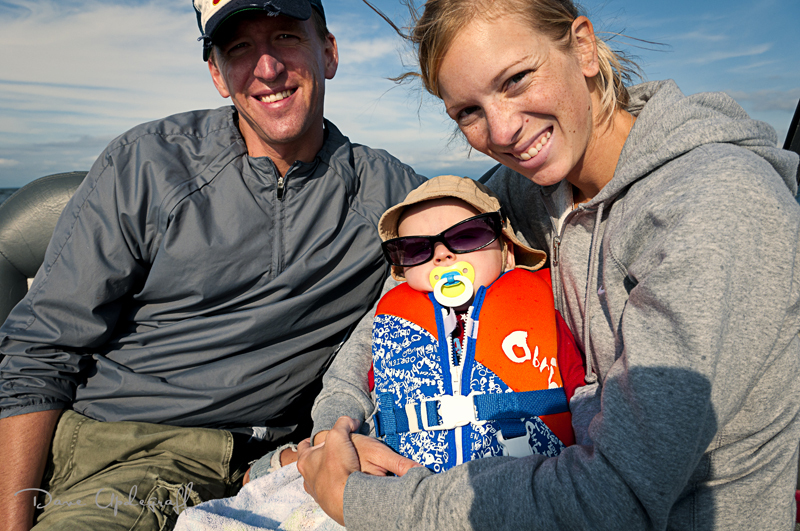 He made quite the little boater with his fishing hat and shades. Of course as long as a guy has his Binky it’s all good. Back at the dock we unloaded the live well from our day’s catch. It made a pretty impressive string of fish. Although the locals and many seasoned fishermen didn’t think much of our catch. I guess most “in-the-know” anglers throw back the unworthy Northern Pike but I like the taste and they are a fun fish to catch. 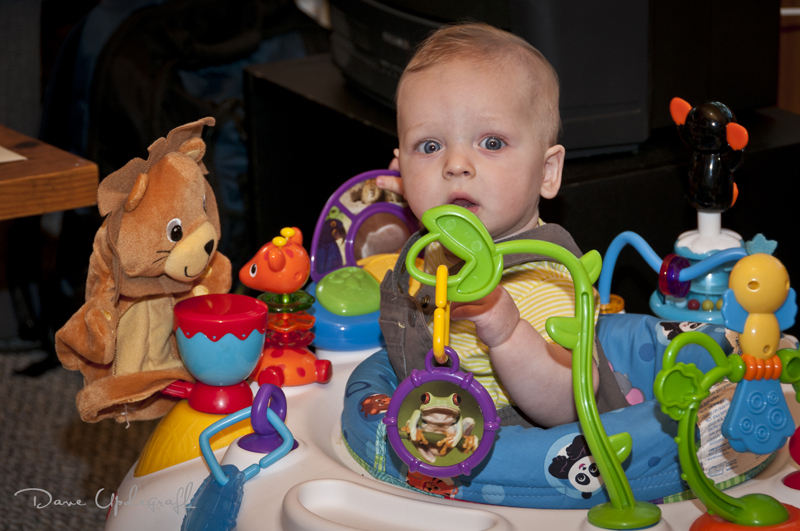 Securely ensconced in his Baby Einstein play area, Josh was once again free to explore all the wonders the learning center has to offer. He would spend hours playing with each attachment and then show a good deal of satisfaction in his ability to manipulate the various objects. After dinner I walked down to the dock to think about years gone by and just take it all in. 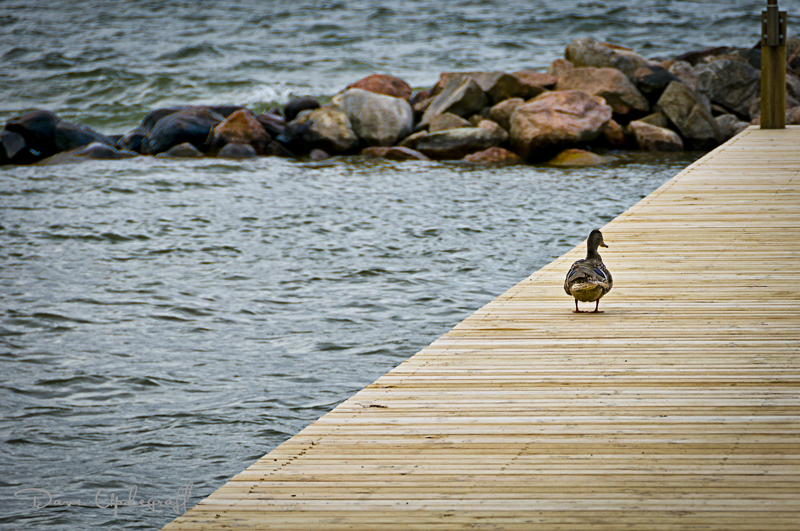 I noticed this duck walking up and down the dock while her mates were on the beach. Out of frame but still on the rocks were the gulls. It was like the duck was making sure the gulls knew their place and not try to encroach on the prized sandy beach. Thanks for stopping by. The adventure continues. Later in the week I will have some really nice sunsets and lake scenes. Enjoy your day and be careful. We woke up to a heavy fog on the lake. 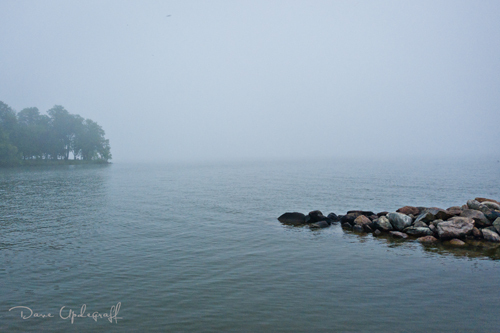 I wandered down to the dock after breakfast to shoot some images of the fog. I just wasn’t able to capture the full essence of the fog as it almost completely shrouded the lake in its mist. The above image is taken from the end of the doc looking northwest. 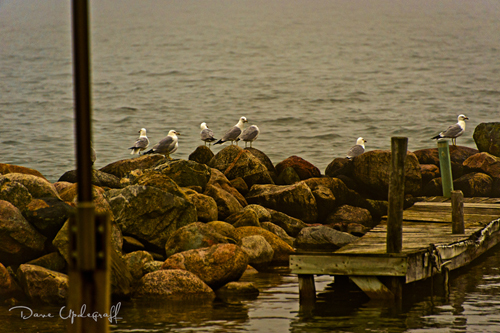 These rocks are at the end of the harbor and they are a favorite resting place for the gulls that claim the dock area as their own. There is a constant turf battle between the gulls and the ducks over the right of ownership of the sandy beach. On this particular morning the gulls had been relegated to the rocks. I tend to think of the lake as this pristine blue watered jewel but in actuality it is a dark, dirty green body of water and sometimes it’s just plain dirty. 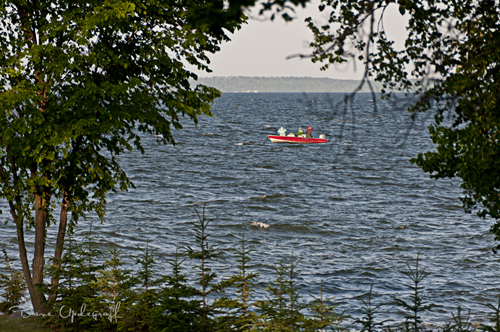 The lake, (Leech Lake) gets its name from the fact that there are millions of leeches in the water. I can remember as a kid when we couldn’t even get in the water because of all the leeches. My Mom use to sit on the dock and watch for them to come into the swimming area. This year I never saw one leech except the ones I put on my lures. The fog finally lifted and the sun came out so we decided to go to my favorite part of the lake (where Dad and I always fished) called Boy Bay. I told the kids there would be a lot of weeds and they would get tired of cleaning their lines but I guaranteed they would catch some fish. It is about an 18 mile trek over water to get there but with this big motor it only took about 30 minutes and we were there. The lake had a lot more water in it than I remember still there are many places in the lake where the bottom is only 3- 4 feet deep. I had just put my line in the water when a 3-4 pound Northern Pike took the bait. What a thrill after 15 years to feel that fighting fish on the end of my line. We didn’t end up keeping him because I thought there was a size limit on all fish but then discovered it only applied to Walleyes. 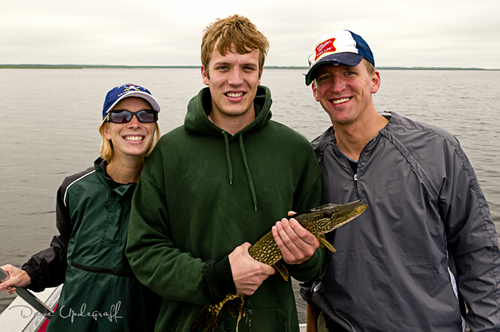 No big deal as we caught and released a ton of Northerns this day. 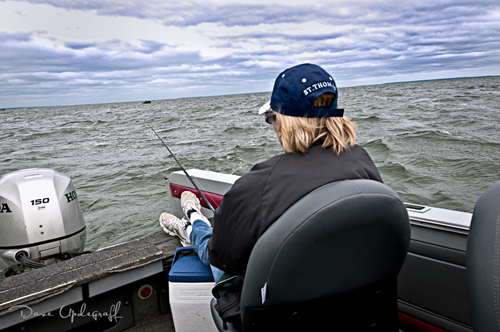 The image above shows Angie and her first catch of the day. It is a small Northern but they fight hard and it makes you think you’ve got a really big fish on. This is Mark’s first catch of the day. He had never fished before so he really didn’t know what to expect. When we went to Minnesota 15 years ago he was only 5 and so he stayed at the camp with Mom and Jeanne. Angie and I did all the fishing in those days. After this image was taken the Northern defecated on Mark’s sweatshirt. I had never seen that happen before. It was funny but what a mess it made of Mark’s shirt. We ended up throwing a lot of Northerns back in the lake and still wound up with a nice string of 9 good size fish. We enjoyed the meal on Wednesday evening. Thanks for stopping by. More images tomorrow of the lake and our adventure. Enjoy your day and be careful. I love this photo of Ben and Joshua. Ben is such an attentive Father and he and Josh have a great relationship. We arrived at the camp about 3:00 pm (one hour before official check in time.) 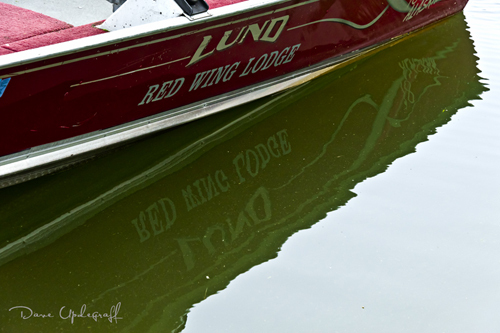 Once we got the cars unloaded and some sense of order to our clothes and other items we then decided, that even though the weather was a little misty and cool, we would get our fishing licenses at the lodge and head out fishing. 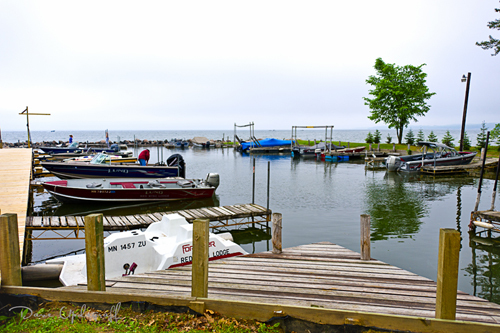 This is a view of the protected harbor at Red Wing Lodge. There is a narrow entry way between the dock and a pile of barrier rocks so you have to be really careful coming in. You also have to raise the prop a bit as the harbor is very shallow and the rocks are very close to the entrance and come out into the channel a little bit. We ran up to a place where I’ve caught some Northern Pike before and trolled around for a couple of hours until the crew got hungry and bored. Fearing a mutiny on the first day I acquiesced and we headed back to the camp. After a hearty meal at a local restaurant we settled in for the evening. The light was still not conducive for pictures but I walked down to the dock just to listen to the waves coming in and to feel the fresh cool lake breeze. 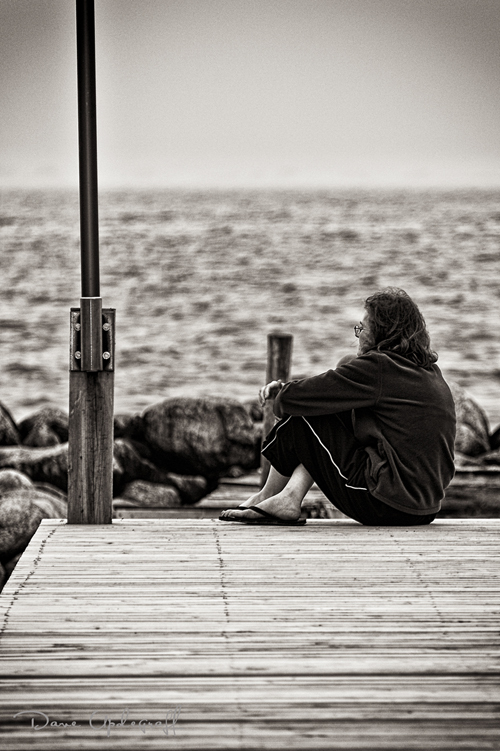 I notice this lady at the end of the dock looking out at the water and thought it would make a interesting image. I never saw her again the entire week and have no idea what was going on with her but she was still there when I finally decided to go in. While there I shot some ducks. 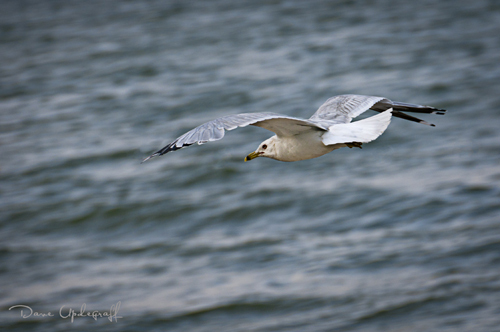 They were constantly at the beach and having an ongoing territorial battle with the gulls. I’ll have more on that later. Good Day. 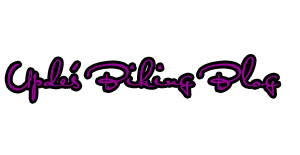 Thanks for checking back with this blog. As you may have guessed I’ve been on vacation. My intent was to blog every day from the Resort as it was advertised “WiFi available under the section describing the cabins. What they didn’t tell you is the WiFi is only available at the lodge (some distance from our cabin) and the three or four cabins that are close enough to the lodge to rob the signal. The above image was taken by Kyle, the resort owner on our last day. Angie, Ben, and Joshua joined Jeanne, Mark and me for a week at Leech Lake near Walker Minnesota, located near Horseshoe Bay. 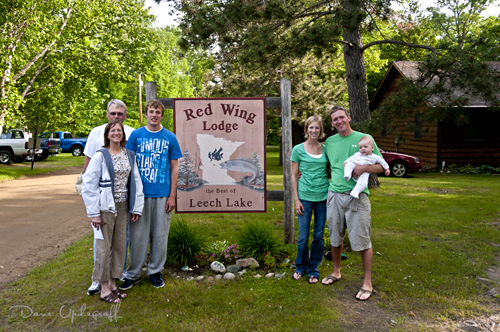 Leech Lake is on an Indian Reservation and is the 3rd largest lake in Minnesota. The above “snapshot” is of the gang at the last rest stop before the camp. Joshua needed a break and something to eat and we all needed a stretch. 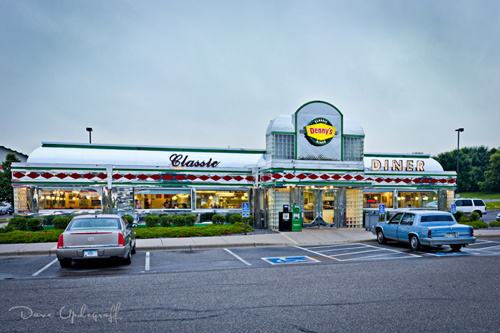 The images (of the diner) I posted a week ago Saturday were from Rogers, Minnesota (just north of Minneapolis) where we spent Friday night. 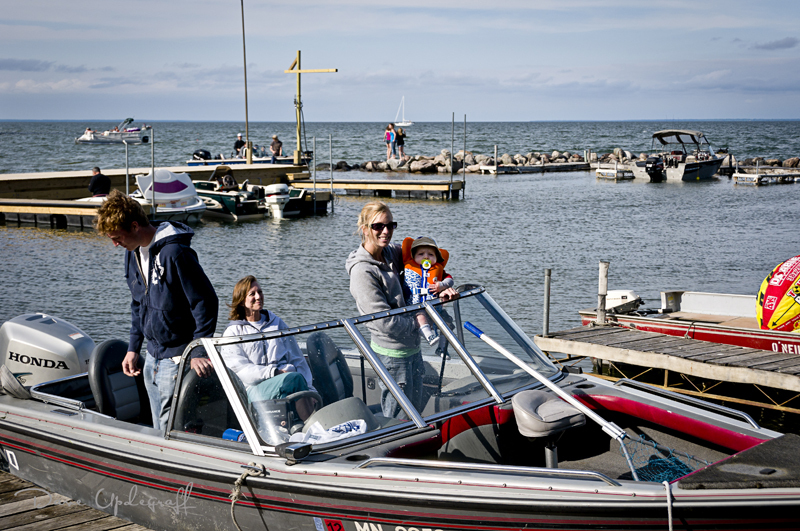 June is one of the best fishing months of the summer at Leech Lake and the weather is usually pretty good for the month. Of course not this year with all the wacky weather this year I can tell you we had some interesting weather for the week which, I will blog about as this week unfolds. I shot nearly 1,000 images for the week. So I will have a lot to show you over the coming days. Many are just touristy snapshots (not really worthy of being called an image.) 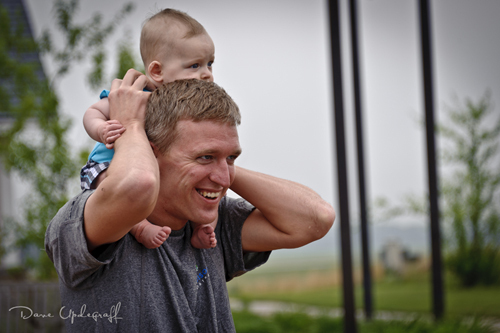 Lots of shots of Joshua and some really cool images that I’m very proud of. This image is for Steve Kent. I promised him a picture of our boat as soon as we arrived. But with no WiFi I couldn’t do that. It was a 19 foot Lund with a 150 hp Honda engine. It had GPS, two live wells, could seat 9, and had a weather cover. That’s the good news. The bad news is that it was an old boat, with an old GPS system and the steering system was so loose that you could turn the wheel almost a full turn before the motor would respond accordingly. 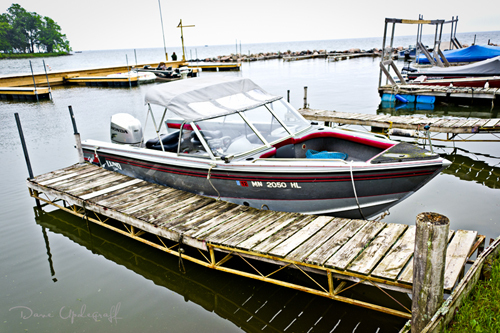 It made for some interesting times in rough water and trying to land the boat at the dock. No camera setting information for this post as these are just hurried snap shots but will have some of the more interesting images later and I will post the settings for them. 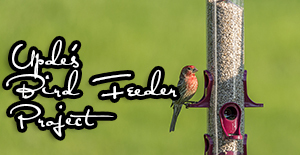 I hope you will follow the blog this week because I do have some fun stories to tell and some great images to share. Thanks for stopping by. Enjoy your week and be careful. Breakfast was another story. I found this “Classic Diner” for breakfast. 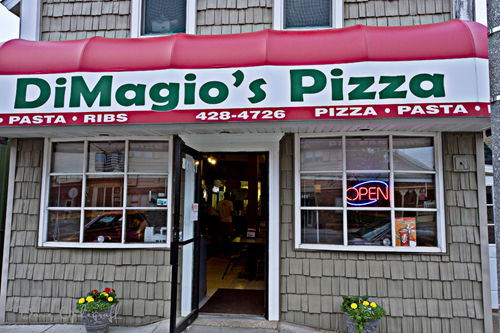 It was spotlessly clean, nice and cool inside and very friendly wait staff. Heck even the food was good so it was a real winner. I was about the only one in the place at 5:00 am. I ordered a ham and cheese omelet and the waitress said, “You can save money if you order our special ham and egg breakfast and you get all the same thing.” Sounds like a winner to me. Anyway like I said not a very long blog this morning. 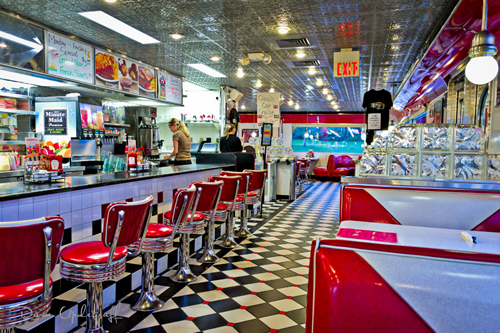 I did want to share the image of the Diner though. They use to have a “real” dinner in the little town my parents lived in and there were only 16 stools. No booths or tables. It truly was a “diner” and if you weren’t a local there you didn’t get the best service or many times the portions of the main entree were pretty small. Jeanne and her Mother visited there as Jeanne was accepting a teaching job in the town and they decided to have lunch in this “quaint” little dinner. They finally got waited on and when the food was served, the portions on their plate were about half what it was of the other patrons in the diner had on their plates. 🙂 Gotta lover small towns. Have a great weekend. Check back tomorrow if you have time for some more discourse. Thanks for stopping by and be careful. Good Day. Thank you for stopping by. I was taking a lesson yesterday morning given by Bill Fortney. He is a seasoned wildlife and landscape photographer and a Nikon Master Photographer. He was talking about his life experiences and he said something to the effect of shooting close ups of things to get a different and sometimes better perspective of them. I thought about that a lot yesterday. He had a powerful life’s lesson in addition to his photography lesson. The Robin above is pretty soft from an image standpoint (I shot it at 1/30 of a second, which introduced some camera shake) but I like it because I see a hundred Robins a day and never pay any attention to them. 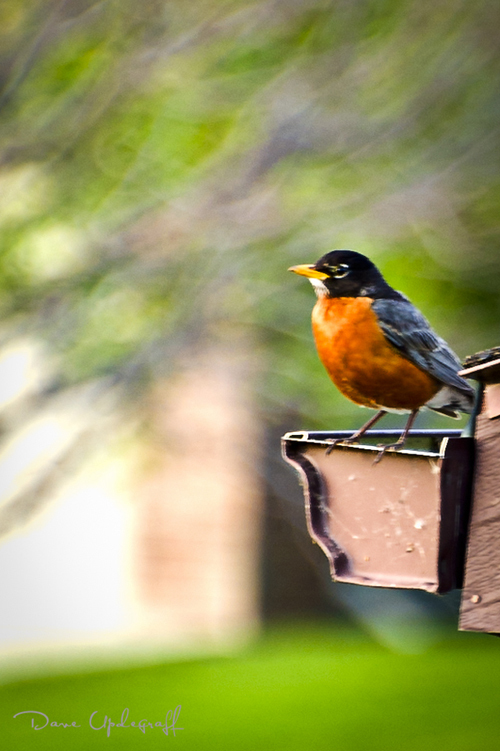 I noticed this little guy walking around on the rain gutter so I got as close as I could and captured this image. 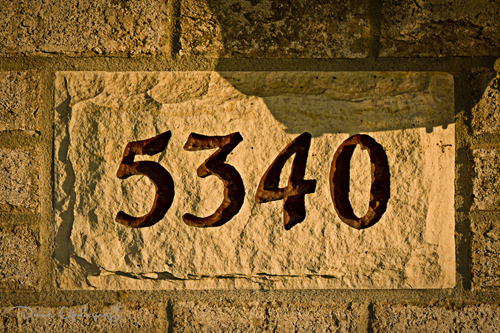 The next image is the numbers on our home. We’ve lived here for 18 years and I’ve never paid attention to them but as I looked at them last evening there was something interesting about them. This all started after the rainstorm when Jeanne said, “There are some beautiful clouds in the sky why don’t you photograph them?” After taking some cloud pictures (which is not as easy as it sounds by the way) I started looking around the house (a closer look) and saw things that I have not paid attention to in the past. Above, the clouds that I originally went outside to photograph. 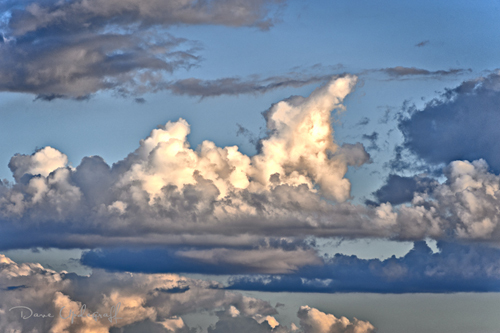 (You can never have too many cloud images in your collection.) You just never know when you’re going to need a nice sky. Anyway the entire point to this post (if there is indeed a point) is that one must sometimes look at familiar things from an unfamiliar perspective. Peel back the layers as it were and see what else is there. That’s it for today. Sorry for going all cerebral on you. I’m back to normal now. Enjoy your day and be careful.